Should a gameplay section or quest fail to deliver these components, then that gameplay is ludonarratively inert: it contributes nothing to the game’s narrative. In this paper, I will perform a case study on one of Horizon: Zero Dawn’s side quests to illustrate the larger problem of ludonarrative inertia that plagues this game. Up to this point, it has been easy to pick on games that blatantly and unapologetically compromise creative ambition for commercial appeal and publishing convenience. To echo the popular disappointment with the now ubiquitous open-world, sandbox genre, games such as Assassin’s Creed: Syndicate and Mass Effect: Andromeda deliver experiences that feel surprisingly shallow and unfulfilling given their grand narrative ambitions and promises for a bevy of content. The larger gaming community has become a broken record, continually deriding the same core issues in what amount to be fundamentally the same games these AAA studios produce on an annual basis. Feast your eyes on all this “narrative” (Assassin’s Creed Unity). In an effort to draw attention away from these usual suspects, I will attempt to levy that very same criticism on Horizon: Zero Dawn, a game that has unduly become universally celebrated, by critics and fans alike, as both a beautiful open-world game and an evolution in video game storytelling. Horizon: Zero Dawn convincingly presents a compelling narrative and engaging game mechanics, but I will show in this article that the game fails as a whole because its core gameplay and narrative do not meaningfully reinforce each other. 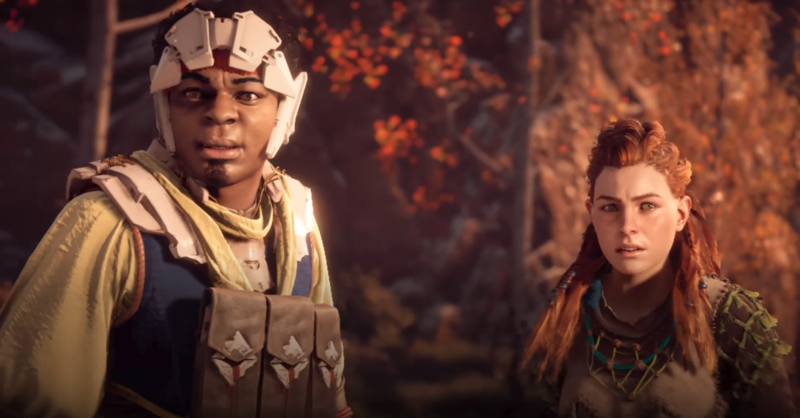 Despite the fact that Horizon’s world is aesthetically pleasing, the moment-to-moment interactions the players can make in that world are reduced to conversation, combat, or mere traversal. There are few opportunities to meaningfully impact the world around Aloy, the avatar. This limits the open-world, one of Horizon’s most attractive features, to the status of mere ornament: always something to ogle, but never something to touch or feel. Oh Horizon, you had me at particle effects. The game revolves around a young woman seeking redemption in a post-apocalyptic, lush, and overgrown world filled with mecha-dinosaurs. Imagine the excitement and possibilities that were considered when this new IP was pitched, only to result in a final product that leans on cinematic cutscenes to deliver the more complicated parts of its story, while reducing player gameplay to combat and climbing cliffs. Aloy’s pivotal arcs and decision-making and major story progressions are unveiled through cutscenes in a blatantly predetermined manner, leaving little opportunity for player gameplay to shape the narrative beyond a few select set-pieces in the main questline. This lack of relationship between narrative and gameplay divides the player’s experience between “firing arrows” or “climbing” on the one hand, and “watching” the story unfold on the other hand. Very rarely is the player ever allowed to steer the story in a truly interactive manner, reducing player interaction to running errands instead of making important character and story decisions. The story’s structure can be distilled to the Hero’s Journey in an open-world-game format, featuring a storytelling Trojan Horse: an exciting, action-filled plot that is designed to subtly engage with profound themes and universal truths of the human condition. Aloy is dispatched from her tribe of the Nora after a brutal attack by their equivalent of terrorists; her immediate goal is to track them down and prevent them from bringing the world to a mechanized end. The deeper story, within that Trojan Horse of a counter-terrorist attack, is one of compassion for those different from you, lost parenthood, and an acceptance of the unknown after living a life in forced shame and exile. It is a denser narrative than your average video game, and its undeniable impact on players is what likely helped it garner its acclaim. Unfortunately, the game’s ludonarrative inertia leaves players in the role of mere voyeurs peering in on this story. When you’re on the way to uncover your true heritage but you decide to just blow sh*t up instead. Horizon’s gameplay is an iteration of the modern sandbox formula: thrust players into an open-world and distribute vantage points, quests, and collectibles throughout the landscape to optimally drive player exploration and satisfaction. Players are given the choice to engage in the main quest (which progresses the game’s plot), side quests, and the numerous errands, akin to the unlimited radiant quests of Skyrim. There are also a number of different vantage points (towers that reveal sections of the minimap) and collectibles scattered throughout the world, but these do not actually impact the narrative, aside from implying a deeper mythology to the game’s world. 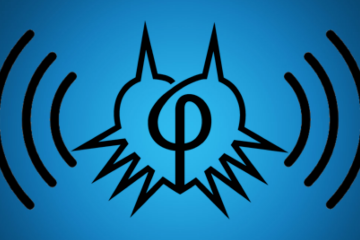 The game mechanics themselves are primarily split between conversation wheels, world-traversal (movements such as running and climbing), and combat that consists of utilizing an arsenal of weaponry and traps to overcome machine-beasts and humans alike. At many points during cutscenes, the player has the opportunity to ask questions of NPCs, particularly when receiving and completing quests, as a means of facilitating extra exposition. The only times when the player can make meaningful dialogue choices is in tone and manner of the avatar’s response that varies between “brain” (logic and reason), “fist” (angry and threatening), and “heart” (compassion). Yet these choices ultimately do not impact the progression of these interactions, apart from varying one-liners from the NPC as a direct response to your decision. While the varying NPC responses suggest player impact on the narrative, the ultimate progression of these conversations and the overarching story remain the same, regardless of player choice. The only actual narrative decision the game leaves to the player. Not all of the game’s quests and activities are ludonarratively inert, but many of them are. To that end, let us examine one particular quest, “Underequipped,” which I have found to be emblematic of the game’s broader ludonarrative problems. Talk to Lubavad or not, he’ll be waiting for your help…forever…. “Underequipped” is a straightforward quest with one solution and gameplay sequence that the player must “promise” to undertake, as there is no option to outright reject their request. While the player may “break that promise” by choosing to ignore the quest, the game never acknowledges that by including a fail-state: until you’ve completed it, the quest and its relevant characters remain in limbo, continuing to wait until the player chooses to pick up where they left off. The primary ludonarrative implication for the player’s choice to fully ignore this quest would then be that Aloy is a less honorable person who breaks her promises. Yet, even that potentially interesting ludonarrative is not allowed to emerge because the gameplay design assumes cooperation, and has not authorized the player’s refusal to cooperate. The choice to ignore the quest merely delays its progression. Thus, the entirety of “Underequipped” evolves in essentially the same manner across every playthrough. Returning to our synopsis: after Aloy agrees to help Lubavad, she takes his ammunition to deliver and help rescue his stranded caravan, only to find them ransacked. By the time she gets there, there is already another incoming raid from nearby machine-beasts, and so she is thrust into a last-stand sequence in which she destroys every enemy in the vicinity until the screen fades to a cutscene. Note that, at this point, Aloy has already been featured in this combat scenario several times for other reasons, though none of these has substantially developed either her own character or the broader narrative. Aloy continues on the mission, and the player uses the “Focus” ability to track this traitor, Dirid’s, footprints up the hill to find the man in hiding. He plays dumb, so Aloy accuses him of being a traitor. Dirid becomes defensive, but before he can say anything else, a machine shoots him dead—yet another plot twist! So, Dirid’s dead now, and while the player might want to just leave because they’re no longer especially invested in this (aside from a trivial amount of currency that the player also did not even ask for), the game assigns Aloy the task of killing the beast that killed Dirid. Once again, as a player, I find myself engaging in combat that, while “challenging” and “fun,” does not reveal anything further about the story or the characters involved. I have no investment in the initial interaction with Lubavad, nor in the band of stranded merchants, nor in this Dirid character to which Aloy spoke for about 3 seconds before he died. Yet, despite all this, I am tasked with dispatching this machine-beast, even though it really did was inconvenience me. Once Aloy finally kills this beast, she is tasked with talking to Dirid because, apparently, he is still alive after all. She exchanges a few words with him, inferring that he regrets his actions, and she recovers the money he took from the caravan. You got me there for a moment, Dirid. Finally, the player must run Aloy all the way back to the caravan and return the money, receiving a small portion of it as a reward. Lubavad, the initial quest-giver, is nowhere to be seen or mentioned at this point. You would not have been foolish to have expected this side quest to be more compelling. After all, it has its own cutscenes dedicated to it. So why is it ultimately such an uninteresting chore? Why did I, for the majority of this quest, feel ludonarrative inertia? As an amendment to the Rule of 6, I would like to further justify the bottom ranking of “Challenge,” typically considered to be the most important aspect of gameplay. While “Challenge” is listed as the lowest priority, it is still an essential component to a ludonarrative. Conflict, whether emotional, physical, internal, or external, plays a heavy role in conveying to the player key information about their characters. Inherent in a conflict is “Challenge,” which stresses characters and the story to change and evolve. However, in the case of Horizon: Zero Dawn, a fixation on challenging gameplay can overshadow the other elements of the Rule of 6, to the point that any characterization of Aloy is limited to conveying Aloy’s ability to overcome any combat or climbing scenario. Thus, “Challenge” by itself is necessary and sufficient to designing mere gameplay, but it is insufficient for a consonant ludonarrative. By this point in the game, the player is aware that conversation sequences are just linear exposition dumps, masked by a “choice” wheel that artificially suggests some sort of spontaneity in making dialogue decisions. Your dialogue choices’ only impact is how much exposition you wish to hear. You are unable to meaningfully influence the story because you are forced to accept the quest. That might be forgiven if the quest had anything to add to the larger story as whole. But instead, the quest forces you through an irrelevant, nonsensical plot that has nothing to add to the larger world mythos beyond the idea that this is a dangerous world that is inhabited by humans and machine-beasts (a point already made by looking anywhere around the avatar). 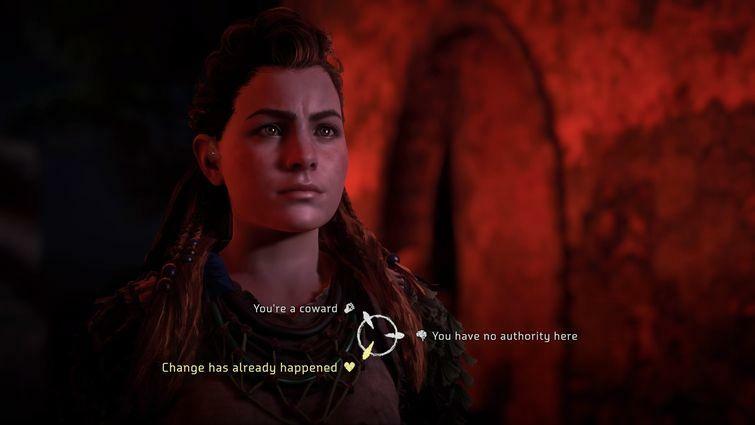 You are unable to make any meaningful choices towards Aloy’s character progression during the quest; instead, Aloy makes important character decisions on her own in player-independent cutscenes, such as when she demands to be paid. This is a missed opportunity: the quest could have easily been structured in such a way that the player could influence the development of Aloy’s character. The Witcher 3, for example, often employed this tactic when it came to accepting quests from disadvantaged quest-givers: players had the option to demand payment, barter for higher pay, or forgo payment altogether. These choices empowered the player to determine whether their Geralt was charitable or greedy, allowing them to mold Geralt’s character as the narrative progressed. In contrast, Aloy has already been established as strong, helpful, good at heart, and pragmatic across the numerous quests you will have been forced to complete before “Underequipped.” Thus, the conversation sequences contribute little to Aloy’s character. Do Aloy’s conversations in this quest contribute to the narrative’s emotional and immersive aspects? These are the more subjective categories, so take my personal evaluations with a grain a salt; that said, my emotional state during these cutscenes and conversations ranged from boredom to minor surprise when the plot twists occurred, so that was something. In terms of immersion, I was operating at a level of “barely invested” as I mindlessly entered the inputs into my Dualshock controller in order to exhaust all the dialogue wheel options, skim the subtitles, and get on with the quest. Finally, for the last two criteria, fun and challenge, this conversation sequence was neither fun nor challenging.  These sequences offer no fun or challenging gameplay mechanics beyond selecting items around a circle. This may be made more fun and challenging if the choices made an impact on the progression of the conversation, so that narrative outcomes may be limited or drastically impacted by player choice (à la Mass Effect). In sum, then, the conversation sequences during this quest fail to satisfy any of the criteria of our “Rule of 6” and are, therefore, ludonarratively inert. Horizon: Zero Dawn does feature a number of compelling conversation sequences. However, in this quest, like in so many others, such sequences are nowhere to be found. The other two aspects of this quest’s gameplay, traversal and combat, do not fare much better than the conversations when analyzed with the rigorous “Rule of 6.” These gameplay elements often go hand-in-hand in games like Horizon, so they are best analyzed in tandem. Technically, the player is expanding the “plot” of this story by progressing through this side quest: moving Aloy from one place to another, helping this man and helping the other, all the while killing machine-beasts in between. 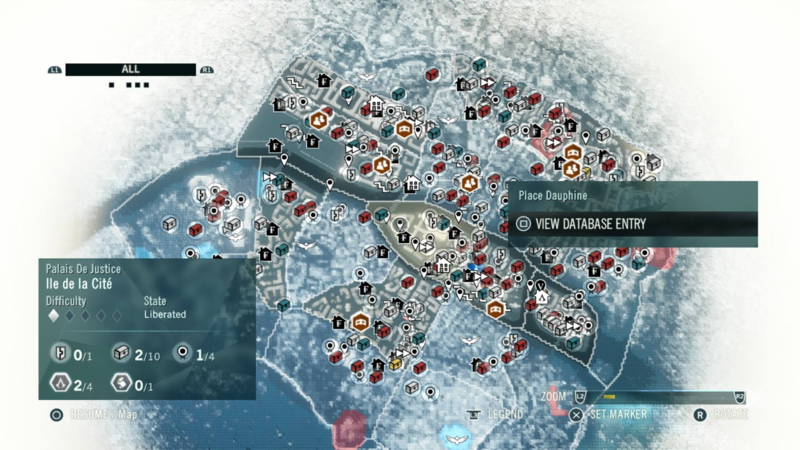 Side quests operate on shaky ground because, by definition, they typically do not contribute a game’s main plot. Therefore, they must compensate by having unique stories on their own that tie into or reveal something about the character or their larger story. Here, having Aloy do the chores of people she has never met/will never meet again and kill machine-beasts contributes little to either Aloy’s character or her larger story, even though quite a lot of “plot” transpires. The inherent issue to Horizon’s combat design is that the repeating gameplay loop of merely tracking and killing mecha-beasts and bandits over the course of 30 hours suffers not only from diminishing marginal returns, but also may actually distract from the main thrust of the game’s narrative. What begins as a tale of compassion and self-discovery devolves into an experience about a young woman who triumphantly develops herself into the perfect killing machine, able to dispatch of mobs of tattooed men without a moment’s hesitation. 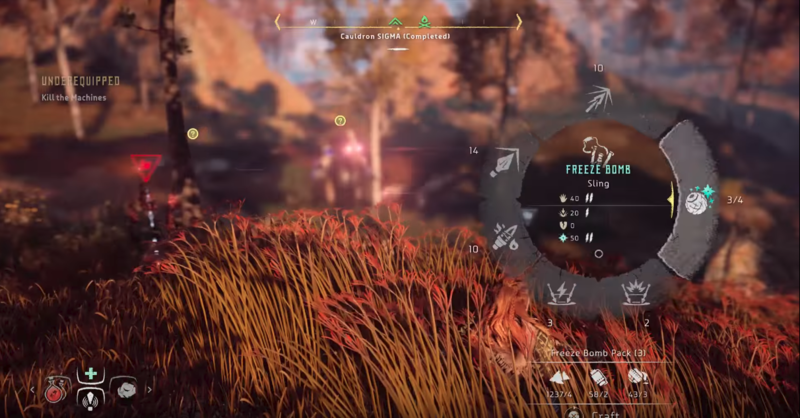 At the very least, that is the goal the gameplay reinforces in the mindset of the player through a skill tree and experience points to cater Aloy’s development to the player’s killing preferences. In this regard, one might read a good portion of gameplay across the medium as the exploration and development of the psychopath. The player spends a majority of the time in the game playing an avatar that coldly commits violence while progressively becoming more effective at such violence and less aware of its consequences. But then the cutscenes intervene to remind the player that Aloy is actually supposed to be a morally good character who actually cares for people… though she is willing to compromise of conventional moral standards to achieve those goals. Thus, engaging in the combat and traversal in this mission takes her nowhere closer to her personal goals and neither she nor the player learns anything about revenge, surrogate parenthood, or the value of acceptance. Ah, finally, the real decisions. With respect to the criteria of emotion and immersion, the combat barely engages beyond a visceral level of excitement when the player is forced into linear combat sections, which is often reliably engaging and requires a particular amount of attention to appropriately complete. However, an ornate combat system is not a sufficient component for a compelling video-game narrative. The combat in particular fails to connect in “Underequipped” because the player has no personal investment in the fate of these merchants and their gold after having just met them, making it hard to feel particularly tense or triumphant throughout the emotional beats of the combat. That, in addition to the fact that the only obligation I felt to complete this quest was my commitment to completionism, made for an emotionally dull yet viscerally engaging combat experience. Altogether, then, the combat and traversal gameplay sequences in this quest are ludonarratively inert. “Underequipped” might have worked better as a piece of ludonarrative content if the outcomes of player input were not so tightly fixed by the game. The developers had a clear pathway and vision for how the side quest should unfold, to the point where they constructed its own unique cutscenes with voice acting to predetermine Aloy’s character and strip away any possible influence the player might have on the quest’s story. The gameplay sections feature rigid, non-variable tasks such as following footsteps and killing a specific number of machine-beasts. I think you’re supposed to feel an emotion here, like fear, but I couldn’t care less. Applying my arbitrarily formed “Rule of 6” so rigorously to a side quest seems silly and overly harsh. But I’ve done this simply to provide a helpful framework for continually thinking about exactly what and why players are performing actions in video games and if those actions are really contributing to the larger narrative. Horizon: Zero Dawn is not a terrible game and it doesn’t have a terrible narrative. In fact, the narrative itself is impactful and the gameplay itself is challenging and fun, particularly when it adopts a Monster Hunter-like combat scenario. There are shining, memorable moments during the main quest, such as when you control Aloy in defending an entire town (à la the Alamo) against an army of beasts all on her own. This displays the character’s unprecedented fearlessness and progresses the story towards an implied doom. 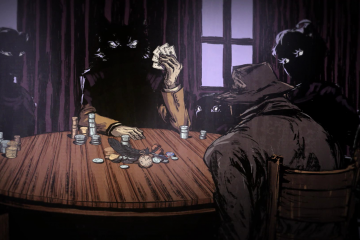 All the same, by delivering many of the pivotal narrative and character-building moments through cutscenes, the developers detach the gameplay from the inherently interesting storytelling, leaving the player to do what is essentially the busy work of running to and from these cutscenes while killing anything that stands in the way. This inert relationship between gameplay and narrative is emblematic of countless of other side quests, the majority of errands, and even a decent portion of main quest content. That is not a favorable batting average. It does not help that Aloy remains a fairly static character throughout a large part of the game except for the inciting incidents of the main quest and the few revelatory, final chapters of the main quest. In the time that the player spends running around performing errands, climbing towering beasts, hunting exotic machines, and speeding through dialogue wheels, there is a mindlessness to the process that becomes ingrained. This sensation of mindlessness, of performing these tasks with no discernible narrative purpose, is what we have up to this point been calling ludonarrative inertia. It occurs when the player is engaged in gameplay that does not meaningfully add to the player’s conception of the game’s narrative and its constitutive parts, story and character. Upon stricter editing of content, there might have existed another version of Horizon: Zero Dawn that was only 20 hours long and told the same exact narrative with the same level of emotional satisfaction and none of the ludonarrative inertia. Reconsider, for a moment, the creative principles behind crafting ludonarrative and cinemanarrative. Storytelling is done better when the mechanics (cinematography and gameplay) service the narrative, and not the other way around. Cinematographic images and gameplay with story motivations ultimately make entire films and video games more effective as narrative works. Why is it, then, that we spend so much time in video game performing tasks that do not contribute to the larger narrative? Key to my criticism of Horizon’s ludonarrative has been the disconnect between the game’s narrative and combet. Given how much time players spend engaging in combat, it is surprising to see just how little substance it adds to the narrative. Think about the action film in contrast to the action game—perhaps Christopher Nolan’s The Dark Knight versus Horizon: Zero Dawn, since they are both highly regarded in their own mediums with similar superhero-type protagonists and ambitious narratives. Combat in both Horizon and The Dark Knight serve essential roles in characterizing our protagonists under stressful situations while allowing them to steer the story. But let us guesstimate the proportion of time Nolan spends on action setpieces in his film versus the amount of time the player spends on combat in Horizon: Zero Dawn. It would be fair to say that 30% of The Dark Knight is spent watching actual combat in action setpieces such as the initial bank heist and the final assault on the Joker, while the latter 70% is dedicated to character interaction and story progression. Such character interaction may still be “intense,” but it does not involve one person physically fighting another. In Horizon: Zero Dawn, about 50% of the time you spend playing will involve either preparing for or engaging in combat with machine-beasts and/or humans. The latter 50% of gameplay time is spent either platforming/exploring or watching cinematics and dialogue sequences. There is a reason why the film commits less time that the game to combat action. 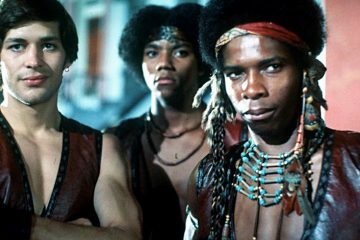 There is a general idea in balanced action films that viewing combat for an extended period of time can lead to excessive setpieces that, after a point, begin to add diminishing marginal returns for the narrative. Editors have honed in on this feeling, and have established a convention of editing action to be brisk and sharp, rather than longer and extended. This isn’t as awesome the 60th time you have to do it. In the case of Horizon: Zero Dawn, half of the time that the player controls Aloy, they will be concerned with fighting enemies and becoming stronger so that they can defeat commensurately stronger enemies. Three quarters of the remaining 50% of gameplay will be spent traversing the beautiful world, and the last quarter will actually be spent in dialogue and conversation. 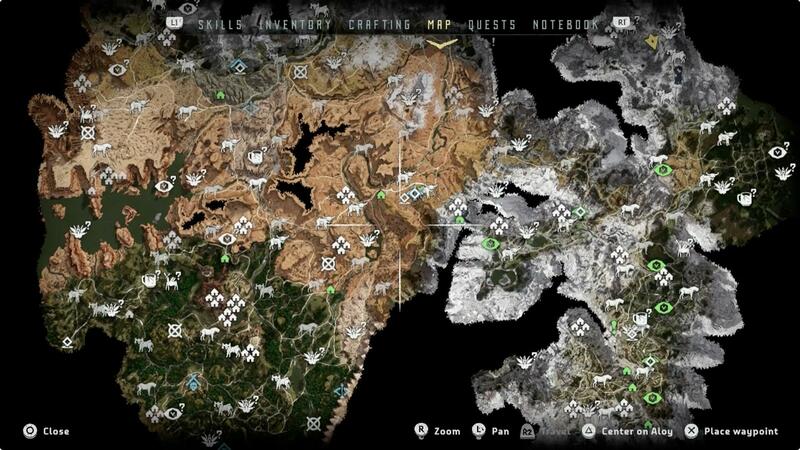 In the average 42 hours of time it takes to complete Horizon: Zero Dawn, around 21 hours will be spent in combat. It’s certainly possible for combat to be a useful ludonarrative mechanic. The Last of Us used it in a survival context: it reinforced the idea that uncompromising, desperate violence was the only practical way to survive in its bleak world. However, Horizon: Zero Dawn’s combat is mostly concerned with hunting and, at times, self-defense. For the most part, mission and world objectives feature Aloy initiating combat upon unwitting machine-beasts and raiders (who deserved it, I guess). Horizon is really a game about killing mecha-dinosaurs in the coolest way possible. One can think of this combat as a parallel for the continuing growth of Aloy as a hunter as she garners more experience and skills to achieve her goal of becoming the greatest hunter of the Nora, who have continually held her back for not being “pure.” This is actually quite the empowering theme for her character. Technically, Aloy is also clearing the world of bad men and dangerous beasts, which may contribute to the world-ending plot, but her violence does not necessarily contribute to her story of a lost childhood, nor does it make the world’s lore much more interesting. It certainly does not contribute to the overall narrative about the merits of compassion. In sum, then, the best narrative merit of these 21 hours of combat is the empowerment of Aloy’s character. Though combat takes up about half of the time a player spends on the game, it only really relates to one facet of the overall narrative. Let us imagine what Horizon: Zero Dawn might look like with a different balance of mechanics. What if players spent 17 hours (40%) of the game in combat scenarios and 25 hours (60%) in more direct character-interaction scenarios and other types of decision-making (assuming that these weren’t ludonarratively inert, this time around). That is still plenty of time given towards the combat mechanic its theme of empowerment, but it also provides more opportunities for the player to interact with the world and its characters in ways other than killing them. More time could be spent taking in setting and atmosphere, or actively engaging in more complex character relationships instead of watching them unfold before you in their predetermined paths. This would make the player more invested in the world and characters that they are responsible for saving, thereby making the climactic action setpieces all the more meaningful. Again, I am not suggesting that combat in video games be abandoned altogether. Instead, I hope to have proposed a helpful exercise to prompt gamers to think about what stories conventional mechanics such as combat are telling, and if we really need to be spending so much time engaging in them, regardless of how fun and challenging they are. Give us more small, character-driven moments like this. Instances of ludonarrative inertia do not wholly invalidate games like Horizon: Zero Dawn. However, ludonarrative inertia holds them back from telling stories that would otherwise be compelling. It is easy to be seduced by the power of aesthetically pleasing worlds and engaging combat systems, but that should not be the criteria to which we hold open-world storytelling. If anything, that design principle is emblematic of the entire modern open-world sandbox formula. Horizon: Zero Dawn neither revolutionizes nor even iterates on the maligned Ubisoft formula. Instead, it represents the industry and the larger community’s reaffirmation of a stagnant storytelling philosophy.